A question from the kangaroos! My name is Eva and I am 4 years old. We live in Melbourne, Australia where there are lots of kangaroos! I would like to know what do you eat for breakfast in Japan? I, and my little sister Neave, like to eat porridge with honey and milk! But sometimes we have bread with jam which is also yum! I would like to know what do you eat for breakfast in Japan? Lulu: Sometimes we eat mochi. 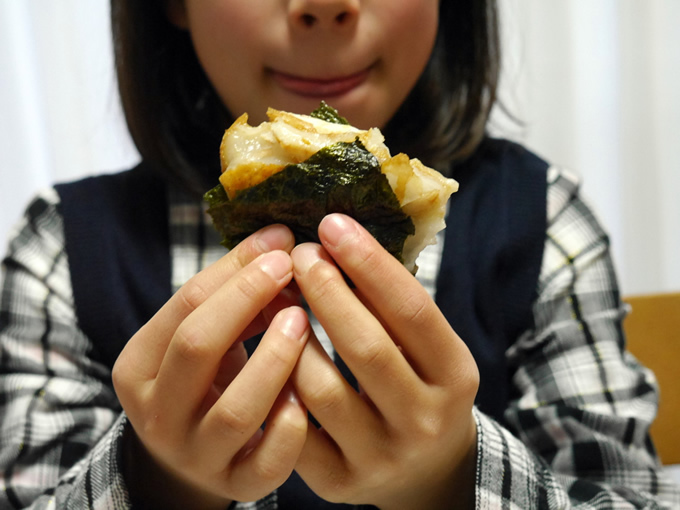 It's a chewy rice cake with seaweed wrapped around it. It's really good! Roy: But we also eat cereal, and bread and jam. Lulu: I like our Mom's kiwi jam! Roy: I like strawberry jam, too! Thank you for your question, Eva and Neave! Enjoy your porridge, but watch out for the three bears! Thank you! We like the sound of the chewy rice cake and we love soy sauce but we are not so sure about the seaweed! We will stick to our porridge but Mum promises we'll have 'Hot Cross Buns' soon for Easter...if we are good! We recommend wrapping seaweed around those hot cross buns!